The 1940’s were an incredible time for director Alfred Hitchcock who was still relatively new to Hollywood at the time. This decade saw him solidify his status as “Master of Suspense” with films like Rebecca, Lifeboat, Notorious, Shadow of a Doubt, and Spellbound. Rope is one of Hitchcock’s many unsung classics from this era – combining his trademark suspense elements with groundbreaking filmmaking to create a bonafide classic. The film was shot to appear as if it is a single continuous shot (there are 10 very well-hidden cuts throughout), and takes place in real time. Hitchcock continues to explore the idea of using a single location to create a sense of isolation and claustrophobia – a theme that would bring him even more success with 1954’s Rear Window. Rope sees two young men (Farley Granger and John Dall) trying to cover up a murder during a dinner party – until their former school headmaster (James Stewart) starts to see the holes in their story. 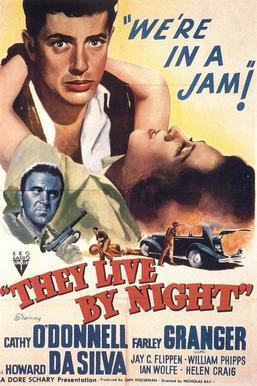 Hitchcock uses the single location and limited cutting to great effect, creating one of his most suspenseful and engaging films of the 40’s. Director John Farrow (father of the highly-acclaimed actress Mia Farrow) was incredibly prolific as both a writer and director for nearly three decades. It wasn’t until 1948’s The Big Clock that he truly struck a long-lasting chord with critics and audiences, and even after its release he would fail to live up to the film. Farrow was nominated for Best Director for 1942’s Wake Island and even won an Oscar for writing 1956’s Around the World in Eighty Days, but those films haven’t endured the test of time like his famous film noir has. The Big Clock stars Ray Milland, who just three years prior had given what I would consider to be one of the all-time great performances in The Lost Weekend, and the legendary Charles Laughton, whose acclaimed roles are far too plenty to list here. Maureen O’Sullivan, the wife of director John Farrow and mother of Mia Farrow, also stars. O’Sullivan was widely known at the time for playing Jane in the Tarzan series of films. Her role in the film came after a prolonged absence from the screen, and was met with critical praise, but she soon after opted to retire from the screen permanently. The Big Clock is based on a famous novel of the same name, written by Kenneth Fearing, and has been adapted for the screen a number of time since its publication. Earl Janoth (Charles Laughton) and George Stroud (Ray Milland) in the beginning of 1948’s The Big Clock. 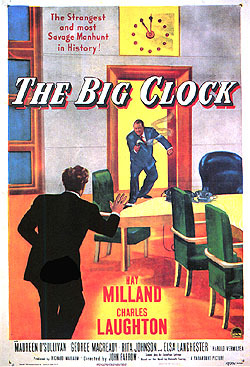 The story of The Big Clock sees our main character, magazine editor George Stroud (played by Oscar-winning Ray Milland), being fired at the outset. Stroud is eager to take a vacation with his wife Georgette (Maureen O’Sullivan), but plans his slowly become unravelled after gaining the attention of the beautiful Pauline York (Rita Johnson). Pauline is the mistress of George’s former boss Earl Janoth (Charles Laughton), which is partly why she shows so much interest in the down-on-his-luck George. The two hit it off and devise a plan to blackmail the media mogul Janoth. Soon after George leaves her apartment to reunite with his wife, Pauline is quickly murdered after a passionate spat with her lover. Little do the two men know that they quite literally bumped into each other in the hallway of Pauline’s apartment building, both men’s faces shrouded in darkness. Janoth now looks for the man in the hallway so that he can pin his crime of passion on the mystery man, and unwittingly hires George back in order to track down the mystery man. Now George must both lead the investigation and manhunt for the “murderer”, and cover up the fact that he’s the man the media is so desperately searching for. Will Pauline York’s true killer be caught and brought to justice, or will the wrong man pay for a crime he didn’t commit? You’ll have to watch John Farrow’s excellent The Big Clock to find out for yourself! The Big Clock is as twisty-turny as film noir gets, and in this case it definitely works to its benefit. The film keeps the audience on its feet and keeps you guessing whether Stroud or Janoth are going to get caught, and how they’re going to be able to get themselves out of the situation. The scenes in the first act of the film involving George Stroud and his wife Georgette are quite funny and relatable, and set a very good pace for what was to follow. Ray Milland and Maureen O’Sullivan had terrific chemistry together as the Stroud’s, and when Georgette decided to tag along with her husband I was overjoyed. The may not be the most effective team due to some awkward gender roles of the time, but I still had a lot of fun watching the couple on-screen. Charles Laughton’s performance as Earl Janoth is diabolical and hammy in the best way possible, and it’s obvious why Laughton is so highly regarded as an actor. He seems to play a villainous character with ease, being both incredibly intimidating and slimy all at the same time. His scenes with Milland’s George Stroud are tense, and the way he commands the screen just begs the attention of the viewer. Director John Farrow also deserves a great deal of praise, commanding evocative performances from the entire (albeit talented) leading cast, and also for a variety of taught directing techniques. A long single take shot towards the beginning of the film sets the tone for things to come, and is expertly handled by the veteran director. Reveals of the many twists and turns in the film’s script are handled with subtlety, making the audience piece together some of the clues and do some thinking instead of spoon-feeding them answers. In short, The Big Clock is a tight, tense, atmospheric film noir that will keep you on your toes. The performances from an all-star cast are terrific, the writing respects its source material and doesn’t insult its audience, and John Farrow’s direction is somehow both subtle and stylish. All of these elements combined lead to The Big Clock being regarded as one of my favorite films of this month’s marathon, and I now feel compelled to seek out similar stories, as well as more work from director John Farrow. The Big Clock is highly recommended! The story of two young lovers on the run from the law is a wildly popular tale in Hollywood history, and many of its origins can very likely be traced back to 1948’s They Live by Night. Nicholas Ray’s film noir is seen as many to be the prototype to the story of Bonnie and Clyde, a film many consider to be the most successful of the subgenre. Though the similar stories had been told in the past (specifically in Fritz Lang’s 1937 You Only Live Once, and Hitchcock’s The 39 Steps), Ray’s film modernizes the story for a new generation. Films that would follow the same story arc as They Live by Night include: 1950’s Gun Crazy, Jean-Luc Godard’s Pierrot le Fou, 1967’s Bonnie and Clyde, Terrence Malick’s Badlands, Gus Van Sant’s Drugstore Cowboy, and most recently Wes Anderson’s Moonrise Kingdom. They Live by Night would be director Nicholas Ray’s debut behind the camera, and what a career it would lead to. Ray would go on to direct such films as Johnny Guitar, In a Lonely Place, Rebel Without a Cause, Bigger Than Life, and Party Girl, and is still celebrated and analyzed decades after he passed away. Ray has become something of a cult figure to cinephiles, and his legacy only continues to grow. The film stars young Farley Granger, who would go on to be noticed by names like Alfred Hitchcock and Humphrey Bogart, and the lovely Cathy O’Donnell – a film noir regular for most of her ultimately short career. Farley Granger (Bowie) and Cathy O’Donnell (Keechie) on the run in 1948’s They Live by Night. They Live by Night sees three bank robbers (Bowie, Chicamaw, and T-Dub) escaping from prison early on. Our main character Bowie (Farley Granger) has been wrongly accused of murder and is now on the lam. He decides to hire a lawyer in order to prove that he isn’t guilty of his alleged crime, but first must get his hands on the money needed. After becoming injured, Bowie seeks refuge with a gas station owner and his young daughter Catherine, or Keechie (played by Cathy O’Donnell). After quickly falling head over heels for each other, the young couple decides to get hitched and run away together. Bowie plans to become an honest, hardworking man, but unfortunately for the young couple life isn’t always that simple. Bowie once again bumps into former partners in crime Chicamaw and T-Dub, and is coerced into joining the crew for one more dirty job. Will the young couple live happily ever after, or will the life of crime catch up with them? Find out by watching Nicholas Ray’s They Live by Night. While the film isn’t exactly unique by today’s standards, there’s absolutely no denying the influence it has had on modern film. They Live by Night avoids many of the film noir cliches we’ve come to know and love (and sometimes hate), and instead becomes something much more profound. This is a love story through and through, with very little mystery involved. The audience isn’t left to pick up the pieces or be the detective, but instead get to follow two well-rounded, and young characters who are very easy to like. The film takes a little while to ramp up, but it’s smooth sailing once it gets going. My favorite scene of the involves involves Bowie and Keechie getting married late at night in an odd little establishment. The man officiating the marriage and the two witnesses are delightfully weird and eccentric, and the scene itself is quite funny. This scene helps to relieve the tension felt through the first act of the film, and briefly makes it feel as if things are going to be perfectly okay for the young couple. The performances by Farley Granger and Cathy O’Donnell are both very good, and it’s no wonder why somebody like Alfred Hitchcock would become interested in having the young man in some of his films (Rope and Strangers on a Train). Cathy O’Donnell would become a William Wyler regular, appearing in Best Picture winners Ben-Hur and The Best Years of Our Lives, as well as his film noir Detective Story. For Nicholas Ray’s first feature film, the direction is quite smooth and restrained. It definitely doesn’t feel like somebody’s first film, which is a testament to the skills of the man behind the camera, and probably also to the strict studio system of the 1940’s. There’s a heck of a lot to admire about They Live by Night. It paved the way for some of my all-time favorite films including Badlands, the Tarantino-penned True Romance, Bonnie and Clyde, and countless other greats. The movie definitely runs at its own pace, which helps establish the universe and characters, but unfortunately stops the film dead in its tracks during a few scenes. The important thing is that I was entertained throughout, and thoroughly impressed by how modern it all still feels. It may not be a perfect film in my books, but it’s definitely a fun, thrilling ride. It would make way for one of the most underrated directors of the 1950’s, and its influence is still felt today. It might not be my favorite film in the Noirvember series, but I still found a great deal about it to be satisfied with. They Live by Night is very easily recommended.